Emily Corso, owner of Bold & Badass Fitness, inspires. It’s really that simple. As I spoke to Emily over coffee, I believed for the first time that I could actually learn to power lift and have fun doing it. Bold & Badass Fitness is different from a lot of power lifting gyms and cross-fit gyms. In fact, Emily has created a space where body positivity is the ethos. It’s a gym where you set your own fitness goals without the pressure to conform to any preset standards about how you should look. Emily believes everyone can reach their fitness goals, no matter their body type. Emily’s gym offers a welcoming community – a gym that is not scary or intimidating. While Emily believes achieving a healthy body is important for a good life, her gym is not about weight loss or measurements. Instead, her clients set their own fitness goals, and Emily helps them create and implement a plan to reach those goals. Emily empowers her clients through fitness. Emily says there is no body shaming or preset fitness metrics at her gym. Emily simply asks her clients what they want – what they want to fix or improve. For example, a new client may experience chronic pain. Or, someone may want to improve his or her stamina. Together, Emily (or one of her assistant coaches) and her client set up a plan to get the results the client wants. Then, Emily and her staff not only teach the client how to lift and move correctly, but also how to develop habits that ensure success. Emily reports her clients often start seeing fitness and physical activity differently. Going to the gym is no longer a chore, but more like a ritual that makes life more enjoyable. I asked Emily how she motivates her clients. Her response was simple. She cheers them on. Emily believes more is possible in a positive environment. She wants her clients to be happy while they’re pursuing their goals. So, they keep pictures to show their progress and how their bodies have changed. Emily wants her gym to be a place where people want to come and spend time, without any fear or shame. Consistency is key, she says. Emily explained that as people lift weights, they not only build strength but also improve their cardio fitness. Also, the increased muscle mass protects joints, helping to reduce chronic pain. I suspect her clients also build confidence as they see themselves progress. This confidence probably empowers them to set new goals, creating an upwards cycle of physical fitness and happiness. I asked Emily why her gym focuses on power lifting. Emily believes transformation occurs when we move our bodies that way it was meant to move. So, she teaches 3 – 4 major lifts that get the whole body into action with each lift. For example, one lift could require using the abs for stabilization while other core muscles work in tandem to power the lift. Using our muscles in a coordinated way is how we were meant to move, she says. I think Emily noticed my trepidation of trying to lift when I asked about the lifting. I admit I had images of collapsing into my squat from the heavy weight bar over my shoulders. But as Emily explained how she teaches her clients how to move correctly and adjust their center of gravity to compensate for extra weight, I began to relax. In fact, I started to believe I could lift. Emily believes the body needs movement to be healthy. And, when we move our body the way it was designed to move, we develop a level of fitness we might not have believed was possible. Also, the consistent fitness practice and improvement trigger other lifestyle changes, Emily says. We might start to sleep better, eat better, or have a better view of life. We start to experience a better life. Bold & Badass Fitness offers a variety of services. First, you can sign up for personal training sessions. This is custom one-to-one training that includes nutritional coaching, check-ins with your coach, and unlimited access to boot camp classes. Second, you can opt for semi-private training. This also includes nutritional and goal setting coaching, but you’ll meet with up to 3 other people with your coach. Finally, the gym offers boot camp classes. Here, you’ll work out with a group in sessions that combine cardio and strength training. You’ll also have monthly challenges and check-ins. There’s a reason why these services are so comprehensive. For starters, the services provide accountability. This accountability helps develop long lasting habits and behavior changes. Also, the coaches and services act as a guide for mental toughness and empowerment. Finally, the services encourage community. In a way, the gym acts as a center of gravity for personal growth, both physically and mentally. The community shows what’s possible and that a better life is reachable. Emily is a former mixed martial arts (MMA) champion with a liberal arts degree. While training for a fight, she stepped wrong and almost severed her toe. During recovery, she apprenticed as a personal trainer. Emily realized she wanted to inspire women and help them reach their fitness goals. She also wanted to help people directly and build a community. 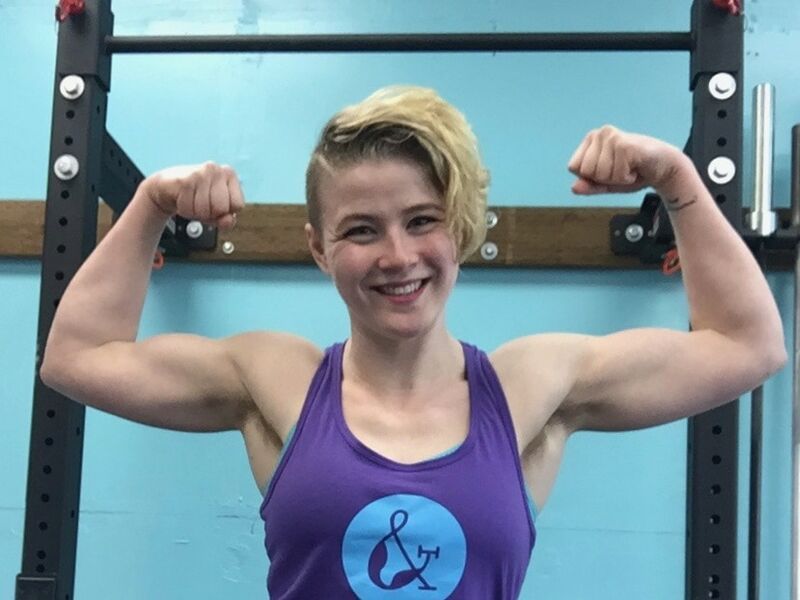 Originally, Emily taught self defense as well as power lifting. She loves combat sports but felt it was inconsistent with the gym. Now, the gym focuses on building fitness through lifting and related cardio training. But, Emily also brings something else to the community she has built. She has created an environment for people to gain confidence in their abilities and in their bodies. She inspires her students to believe in themselves and to believe they can create the change they want. In many ways, Bold & Badass Fitness is more than a power lifting gym. It’s a place to transform your life. Learn more about Emily and Bold & Badass Fitness at its website. You can also follow Emily on Instagram. Make sure to share Emily’s story on your favorite social media channel!